Simply a 'what I'm up to in grad school' for family back home and friends. I took my oldest two kids, Matthias and Alethea, camping last week. 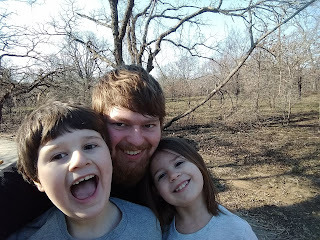 It was Matthias’ third time and Alethea’s second camping adventure here in Texas. So far, we have visited three different state parks; we’re hoping to visit a different park each camping trip. To prove my commitment, I am now the proud owner of a state park pass—hopefully this encourages a few extra outings.